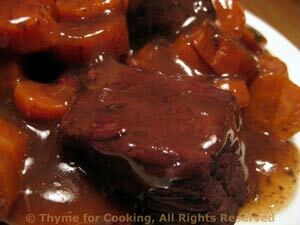 Braised Beef Provençal, easy gourmet dinner for the weekend. This is the 'longest-cooking' of the winter braises that we will be doing. Start it early in the day or the night before. This would also work in a crock pot (I think). 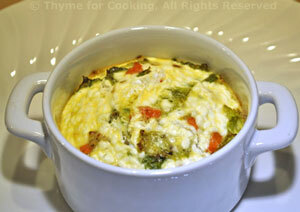 Colorful vegetables, finely chopped, lightly sautéed, then baked with eggs and cheese... An easy first course. Serve directly from the ramekins. Finely chop carrots and cabbage. Heat 2 tsp butter in medium skillet. 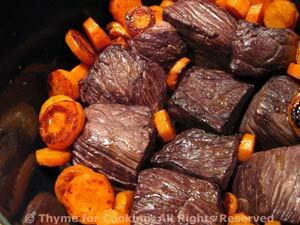 Add vegetables and sauté 8 - 10 minutes, until tender. Use remaining 2 tsp butter to thoroughly butter 2 ramekins. Add mustard, milk and cheese, whisk. Divide vegetables and place in ramekins. Pour egg mixture on top of vegetables, dividing evenly. Put ramekins into a baking pan (I use a bread pan) with deep sides. Pour hot tap water into the pan coming half way up the sides of the ramekins. Bake at 375F (180C) for 30 minutes. 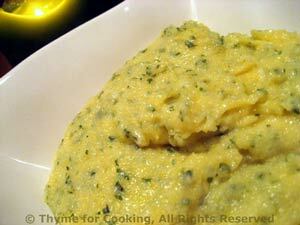 This is one of those long-cooking dishes that I love doing during the winter. It has a bit of bacon and sautéed carrots added, to give it it's own unique flavors. The leftovers will be tossed with pasta for another dinner.